Boat Crunch Can You Ski Behind A Pontoon Boat? Can You Ski Behind A Pontoon Boat? “Can you ski behind a pontoon boat” I won’t waste your time and give you a long-winded answer, I’ll give you a straight forward answer. Yes, you can ski behind a pontoon boat. However, this doesn’t mean that you can ski behind all pontoon boats – some you can and others you cannot. Generally, your boat must meet specific requirements for it to be suitable for skiing or towing a tube. Whether you can ski behind your pontoon boat depends on the horsepower of your engine. To give you an estimate of what your engine is capable of, I’ll provide you with three generalizations of engine capability when it comes to skiing and towing. A boat with a 70hp engine is generally capable of fundamental skiing and tube towing. This means that the boat is just barely capable of the basics. Therefore, you shouldn’t expect to hit high speeds. You’ll also have to minimize the weight of your boat, meaning to limit the number of passengers and equipment that you have onboard. Again, this is as simple as it gets – the pure essentials. A boat with a 90hp engine is suitable for skiing and tubing. This a good engine for taking part in watersports. Though, you will get up to some good speeds, you still can’t expect to be hitting high speeds. The engine will also still limit the number of passengers on-board. I’d recommend no more than 5 people, otherwise you’ll notice a significant dip in speed. This is where it gets good. A boat with a 115hp engine is ideal for watersports. You shouldn’t have any problems with hitting insanely high speeds. It doesn’t get much better than this, you’ll surely be in for a great time on the water. The boat should not struggle regardless of how many passengers you have on board. Despite this, minimizing the number of passengers on board would still be best if you want to hit top speeds. Bare in mind that these are just generalizations of the capabilities of different engines. They may not be 100% accurate, and therefore you should also do your own research into your pontoon boat. Asides from the power of your engine, there are many other factors which must be considered. 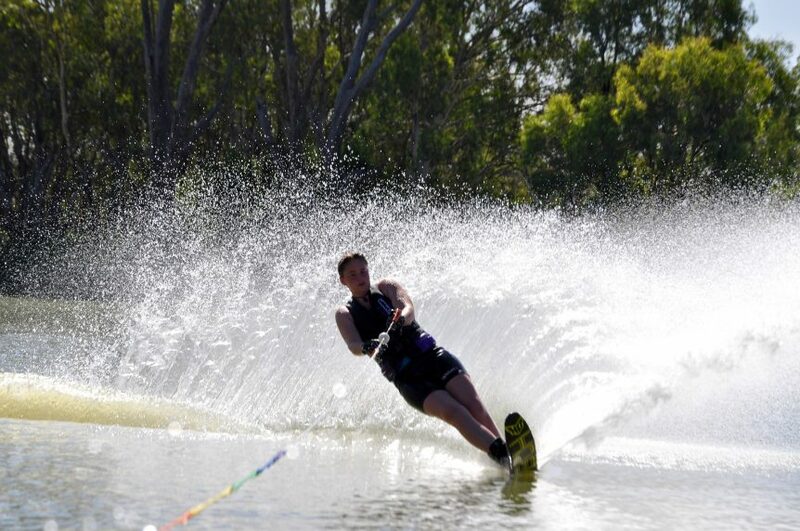 The are several variations of water-skiing however, in generally you’ll want to be in the 15 mph to 36 mph range. I’d recommend somewhere in the middle of that, around 25mph. For towable tubing, you’ll want to be within the range of 20 mph and 25 mph. Depending on the age and experience of the riders, you’ll want to find a suitable speed. For adults I’d recommend around 22 mph. Wakeboarding doesn’t require a lot of speed. Between the range of 15 mph and 20 mph is suitable for a good session. Again, depending on the age and experience of the rider, you’ll want to find a suitable speed. I have produced a guide in which I go into more detail on the subject. Check-out my article on average pontoon boat speeds and watersport speed expectations. There you’ll be able to identify the average speed of some commonly used pontoon boats as well as some information on how fast your pontoon needs to go for certain activities. Though the power of your engine is surely one of the best ways to judge whether you can ski behind your pontoon boat. 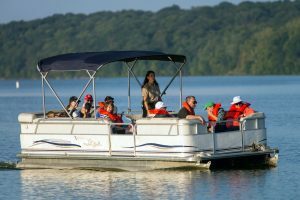 We also need to keep in mind that there are a few possible limitations to using a pontoon boat for water-sport activities. One of the biggest limitations to water sports with a pontoon boat is the unique wake shape which a pontoon boat creates. The wake is the pattern on the water surface which follows the boat. When using a pontoon boat, the wake has less shape. A pontoon will create three different wakes (Two from the pontoons on either side and a larger one from the prop. This is not something which water sports enthusiasts like. They dislike the fact that the pontoons create a wide wake without a significant hump in the middle. The wake created by a pontoon boat makes it difficult to catch air when riding behind the boat. Yes, you can still catch some air if your boat is going fast enough, however it nowhere near as efficient as a v-hull boat which produces a very hump shaped wake. Another limitation of using a pontoon for watersports is the fact that it lacks maneuverability. They have very wide turning circles. Despite this, it’s not too much of an inconvenience. The average person is unlikely to be discouraged by the boats maneuverability. This is only a problem for the water sports enthusiasts and speed demons who love to whip the boat violently. Because of this, I believe that a pontoon boat is suitable for skiing and other watersport activities. The average person whose sole purpose is not only watersports but to also go cruising and fishing, will benefit from purchasing a pontoon boat. Though, if you’re purchasing a boat for the sole or main purpose of participating in water sports then I’d recommend you invest in a ski boat. If you have any further questions you want to ask, then please do leave me a comment below. I’m always happy to answer questions and offer support where I can. Also, if you have any ideas on how I could improve the answer to the questions “Can you ski behind a pontoon boat”, then let me know!